First of all, did you know you can pre-order from Franklin? This will save you time. You will need to order a few weeks before SXSW and you will need to order a minimum of 5 pounds of meat so plan accordingly. As expected, the food was phenomenal. It also came with onions, bread and pickles as you expect. The brisket had a nice ratio of fat and meat that melts in your mouth and the bark was super tasty with a peppery mix of spice. Brisket is king at BBQ and Franklin is definitely among the best I’ve had. The ribs were also awesome with a similar spice rub and the expected fall off the bone goodness. The sausage was tasty but a distant third on the taste meter. 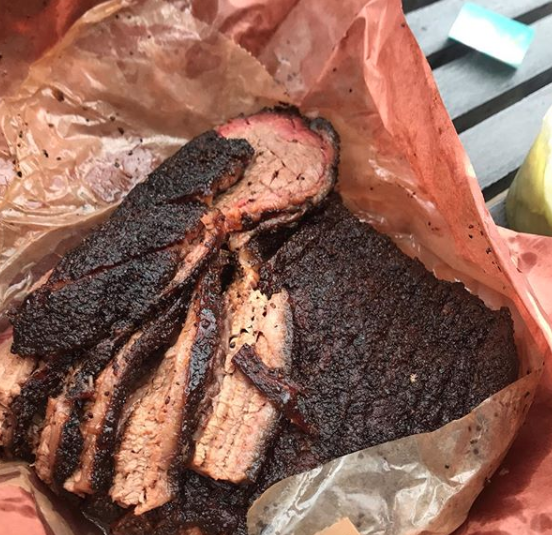 Considering the absurd lineup for Franklin, the real question is … is it that much better then other places like La Barbecue to warrant the wait? I’m not sure. Top BBQ is top BBQ and I’m not sure the small percentage improvement is worth the wait. However, if you do go to only one place, it’s definitely Franklin. 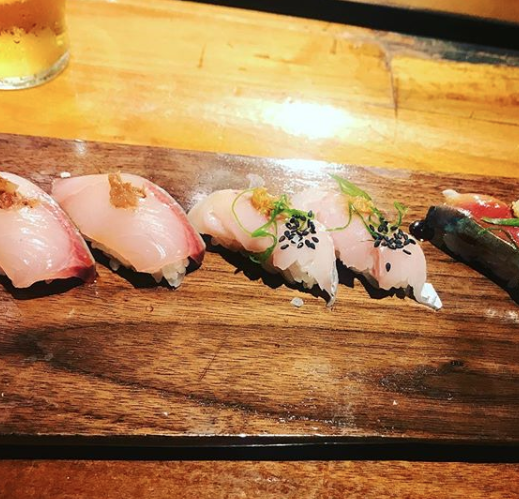 Uchi has been on my Austin Eat list for many years. However, being on South Lamar, its not exactly that close to everything else at SXSW. This year I decided to make the journey and boy, am I glad I did. We chose an unofficial omakase, where the chef recommended some dishes for us based off our feelings. What’s nice about Uchi was that it seems to blend Japanese food with some slight twists. For a lot of the cold dishes, raw fish was paired with a heavy use of citrus, which was a newer experience. Another dish paired the fish with candied quinoa. Aside from the fusion dishes, the fish quality was amazing for a landlocked city. The uni, toro and other sushi pieces we had tasted next level. Pueblo Vieja – Best breakfast tacos within walking distance of ACC, hands down. The Taco Bueno is especially tasty with its mix of chorizo, cheese and potatoes. Ask for the corn tortillas, as they provide a nice texture when heated up and crisp. Kemuri Tatsu-Ya – I think I have to go to this place every year now. Its combination of Texas BBQ meets Japanese food is so unique and so tasty, it’s impossible to ignore. The smoked fish collar is a stunner and the BBQ brisket tsukemon is out of the world. One of my favourite place to eat anywhere. Suerte – Refined Mexican inspired food that served us an amazing cauliflower taco. 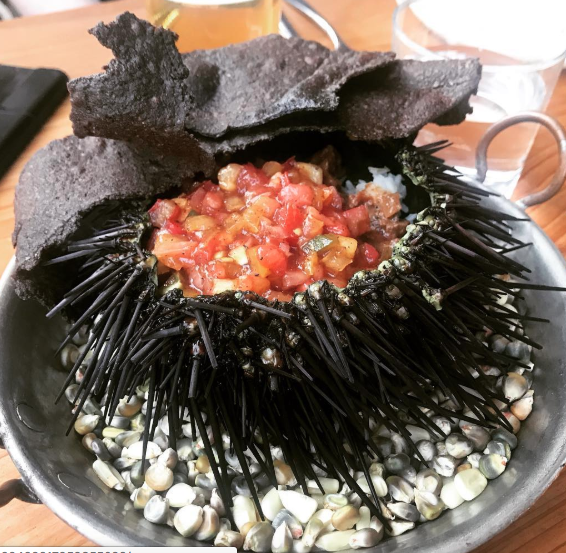 This is definitely fancy in terms of Tacos, and even serves you a crazy Uni dish inside an actual dead sea urchin. You can even take that sea urchin shell home if your name is Gary. Matt’s El Rancho – A highly rated Tex Mex place in South Lamar. I find Tex-Mex food to be only okay at best, but this place was definitely okay. It had a lively atmosphere and was very cheap. You can easily stuff yourself with queso, enchiladas and stuffed peppers here at a reasonable cost. Quality is also only okay.